Dr. Margaret A. Perkinson, received her doctorate in Human Development and Aging, with a specialization in Medical Anthropology from the University of California, San Francisco. She has been involved in gerontological research and education for over 35 years. She has served on the faculty of Washington University in St. Louis, Saint Louis University, and University of Missouri in Kansas City and as Senior Research Scientist at the Philadelphia Geriatric Center. Her research on family care giving, dementia, long-term services and supports, and service learning in the U.S., Guatemala, and China has been funded by NIH/ NIA, AARP-Andrus Foundation, the Alzheimer’s Association, the Illinois Department on Aging, the Missouri Alzheimer’s Advisory Board, and the Administration on Aging. She is an elected fellow of the Gerontological Society of America, the Association for Gerontology in Higher Education, and the Society of Applied Anthropology. She is editor-in-chief of the Journal of Cross-Cultural Gerontology and her most recent textbook, Occupational Therapy with Aging Adults: Promoting Quality of Life through Collaborative Practice, was co-edited with Karen F. Barney, PhD, OTR/L, FAOTA and published by Elsevier Publishers. Dr. Perkinson’s C.V.
Dean and Professor Noreen Mokuau has been at the MBT SSW since 1983. She received her MSW in 1977 from the University of Hawai`i at Mānoa and her DSW in 1982 from the University of California, Los Angeles. She is the Barbara Cox Anthony Endowed Co-Chair in Aging. Her work examines social determinants of health with an emphasis on Native Hawaiians. Presently, she is Multiple Principal Investigator of the NIMHD RCMI Multidisciplinary and Translational Research Infrastructure Expansion grant (RMATRIX II), and Co-Investigator of the US DHHS ACL grant (Hā Kūpuna National Resource Center for Native Hawaiian Elders). Dean Mokuau has edited three books, published numerous journal articles, book chapters and technical reports, and given many presentations on cultural competency and social services for Native Hawaiians, Pacific Islanders and Asian Americans. From the University, she has received the UH Regents Excellence in Teaching Award and the UH Community Service Award; and from the community, she has received the O`O Award from the Native Hawaiian Chamber of Commerce, the Lifetime Educator Award from the National Association of Social Workers-Hawai`i Chapter, and the Educator of the Year Award from the Native Hawaiian Educators Association. She presently serves on the Council on Social Work Education’s (CSWE) Commission on Diversity and Social and Economic Justice and the National Association of Deans and Directors of Social Work (NADD) Board of Directors. Dr. Kathryn L. Braun is Director of OPHS, Professor of Public Health, and Chair of the DrPH Program. She is Co- Principal Investigator and Research Director of ‘Imi Hale — Native Hawaiian Cancer Network, which is funded through a grant to Papa Ola Lōkahi (a Native Hawaiian Health organization) from the National Cancer Institute (NCI). In this role, she mentors Native Hawaiians who want to expand their skills in research, grant writing, and publishing. She also is Co-Lead of the Community-Based Participatory Research Core of RMATRIX, an infrastructure grant based in the John A. Burns School of Medicine to support translational research to reduce health disparities. She has a joint appointment with the Myron B. Thompson School of Social Work, where she serves as Co-Investigator of the National Resource Center for Native Hawaiian Elders. Christy Nishita, Ph.D. is an Associate Specialist at the University of Hawaii Center on Aging and Center on Disability Studies. She received her Ph.D. in Gerontology from the University of Southern California. Her focus is on improving community-based long-term care, with publications on aging in place, nursing home transitions, intergenerational programming, and health promotion. She is the consultant for the Mayor’s Age-Friendly Honolulu Initiative, fostering community intergenerational partnerships and conducting the evaluation. Dr. Nishita is also Principal Investigator for Hawaii’s Alzheimer’s Disease Initiative, a 3-year grant from the Federal Administration for Community Living. She is also evaluator for the Hawaii Going Home Plus project, a federal Centers for Medicare and Medicaid Services grant. She is the recipient of the 2016 Na Lima Kokua Award in the Research/Teaching category, given by the Hawaii Pacific Gerontological Society. She is also Co-Coordinator for the Journal of Intergenerational Relationships, From the Field section as well as member of the Association for Gerontology in Higher Education’s Intergenerational Learning and Research Committee. Dr. Nishita’s C.V.
Dejah Fa’asoa is the administration and fiscal support for the Center on Aging. She received her Bachelor’s degree in Public Health from the University of Hawaii at Manoa in the Spring of 2017. 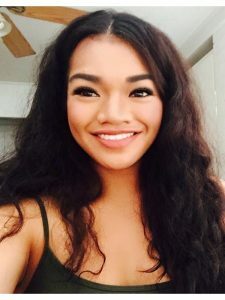 She is passionate about Public Health and maternal and child health care, and her existing research focus is on Cultural Competency and prenatal care among Pacific Island women in Hawaii. After obtaining her Bachelor of Arts degree she plans to further her education in Public Health by getting her Masters degree in the maternal and child health.